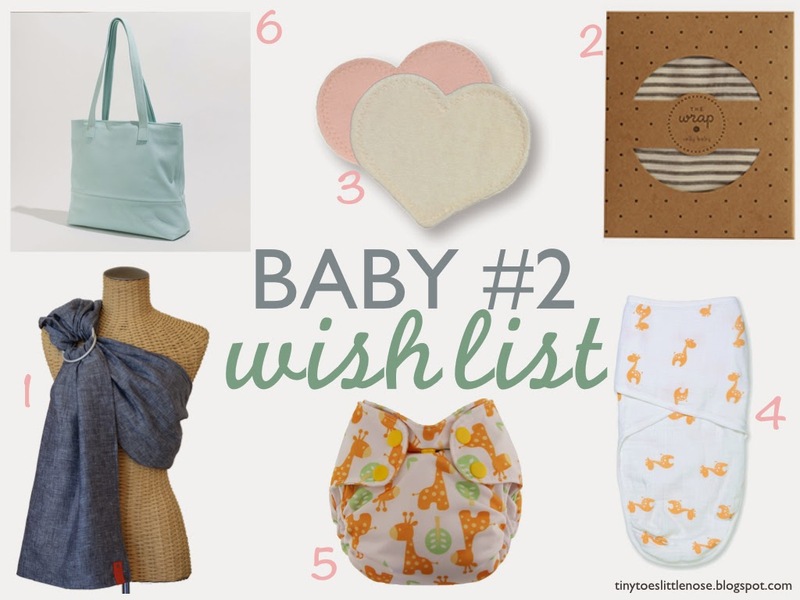 With the excitement of a new baby on the way, I am already coming up with a wish list! Now that I feel like a (slightly) experienced mother, there are some new things that I want to try out with our 2nd baby. I'm really hoping to find out the gender before Black Friday, so that I can do a crazy amount of shopping. If it's a girl, the amount of crazy will be upped! 1. Sakura Bloom Ring Sling: I have heard amazing reviews and feel like this is the Rolls Royce of ring slings. I want to get a double linen, since they are known to hold up better and not stretch out as much. I'm practically ready to pull the trigger on this purchase, but then I saw that Tula is about to release a ring sling and it is really peaking my interest as well. 2. Solly Baby Wrap: I know...another carrier, but I plan on baby wearing all the time, especially since I will be chasing after a toddler this time around. Liam was not a fan of the Moby and neither was I, so hopefully this will be a better wrap option! 3. Bamboobies Nursing Pads: I am leaker and like to use cloth pads, but the ones I had with Liam were so bulky and always showed through my shirts. I'm heard wonderful things about this brand and plan on truly stocking up! 4. Aden + Anais Easy Swaddle Blanket : We absolutely love our Aden & Anais swaddle blankets, but they didn't have the swaddles with velcro when Liam was born. I'm anxious to give this a try with our 2nd baby. While Conor was the swaddle master with any ol' blanket, I was not so lucky. Hopefully I will have better luck with this! 5. Swaddlebees Newborn Diaper : We love cloth diapers and will definitely keep using what we already have, especially since I have a rather large stash. However, this time I would like to get some newborn sizes so that we can start from day 1 instead of waiting for the cord to fall off. Plus, I'm hoping we'll get a better fit during the early days. 6. Caryall Diaper Bag: I have been eyeing this leather diaper bag for awhile. I have no idea what color I would want, I just know that one needs to be mine! My current Petunia Pickle Bottom will work just fine again, but I also want a nicer leather bag that I can use when I want a bit of a fancier option. I rarely carry a purse these days, so this is the perfect mix of the two! One thing you may have noticed is missing from this list is a double stroller.... And the real shocker: we aren't getting one! We have only used Liam's stroller a handful of times, since we spend the majority of the time baby wearing. Liam is great about staying close to me and much prefers to be walking on his own. We just aren't a stroller family, and we love baby wearing. I could go & on about the ease & benefits. Anyways, I may be eating my words later, but I highly doubt it! I adore baby wearing and that Sakura Bloom Ring sling has peaked my interest as well (but eww to the price tag). We use the Ktan wrap and I really love it but I think I need a Solly wrap as well! Great list - Waverly hasn't much of a stroller girl either!! ;). And I have heard great things about the solly! What a great list! I love that bag! I have been eyeing the Lilly Jade bags, but this one is so cute, too! We LOVE our Aden + Anais swaddle blankets. Wish they had the swaddles with velcro when Mason was a baby! We used the ones with velcro way more! Love that bag! It looks perfect for mama and baby! I wish I had known about those nursing pads when I needed some. They seem like they would be perfect! I can't believe I never purchased any during all my leaky days with Liam. I am seriously pumped to try them this time around! Great list, such pretty things!! :) I'm hoping to baby wear more this time around. If you're a pro, I'd love some tips/suggestions/encouragement! !